CEDAR PARK – Greg Rallo’s milestone night and a 34-save performance by Anders Lindback fueled the Texas Stars to a 5-1 win over the division rival Oklahoma City Barons on Wednesday at Cedar Park Center in front of 4,782 in attendance. 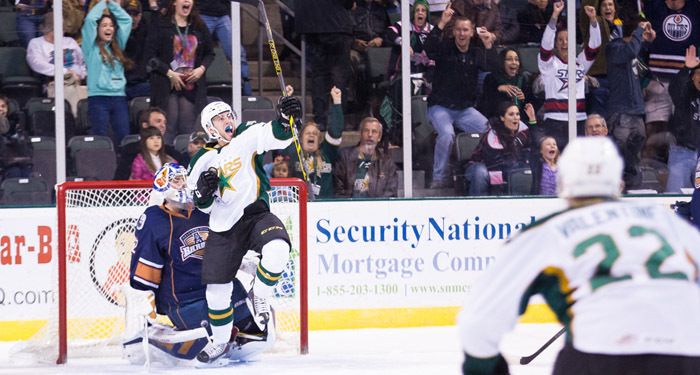 Rallo’s second goal proved to be the 50th of his Texas Stars career. The veteran forward was one of four multi-point scorers for the Stars (9-7-7-0) along with Derek Meech (two assists), Jesse Root (one goal, one assist) and Scott Valentine (two assists). The Texas win snapped a nine-game winning streak for the Barons (14-5-2-2). The Stars continue their homestand on Friday when they host the Charlotte Checkers at 7:30 p.m.
Rallo opened up the scoring on a rebound for a power play goal and his fourth of the season with 4:31 remaining in the first. Just 32 seconds later the Stars jumped out to a 2-0 lead, and never looked back, with Root’s first of the season from the front of the net. William Wrenn’s one-time blast from the blue line at 3:14 of the second extended the Stars lead, and Rallo then added his milestone goal on a one-timer in the left circle three minutes later to make it a 4-0 game off a feed from Meech. Barons’ goaltender Richard Bachman was pulled from the game after Rallo’s tally, giving up four goals on 12 shots in the game. Ryan Hamilton stopped the bleeding for Oklahoma City with just under two minutes to play in the second, stuffing in his 11th of the year past Lindback. Justin Dowling added his seventh of the season for the Stars 1:33 into the third to make it a 5-1 game, toe-dragging his way down the slot before burying his own rebound. Lindback made his third consecutive start since being assigned from the NHL’s Dallas Stars last week, and earned his second win of the year. Bachman was credited with the loss. Brett Ritchie tallied an assist, giving him six points (three goals, three assists) during his four-game point streak. Maxime Fortunus added an assist for points in five of his last six. Scott Glennie saw his four-game point streak come to an end in the win. Texas scored a power play goal for the fourth time in five games. They also held Oklahoma City’s power play scoreless on the night and have killed off 23 of their last 25 penalties over the past six games (92.0%). The Stars finished 1-for-4 on the man-advantage, and the Barons went 0-for-5.